These pages are dedicated to the memory of Frederick James Rotchell and all those who lost their lives aboard HMS Opal and HMS Narborough during a violent snow storm off the coast of South Ronaldsay, January 12th, 1918 and also to the memory of William Sissons - the sole survivor of the tragedy. The Research Trail - and an amazing coincidence! Gallery - HMS Opal & HMS Narborough, the commanding officers, crew and miscellaneous images. Extracts from Admiralty Records ADM 137/3726 - Report of Court of Enquiry held into the loss of HMS Opal and HMS Narborough on 12/1/1918. 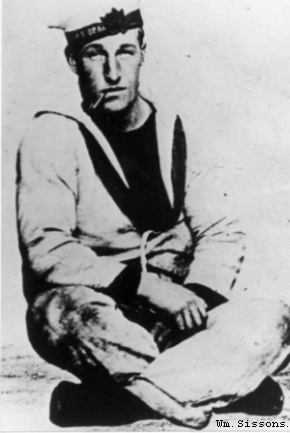 William Sissons Able Seaman J.16486 - the sole survivor. The Internet, Fred Rotchell and an Orkney cormorant ! 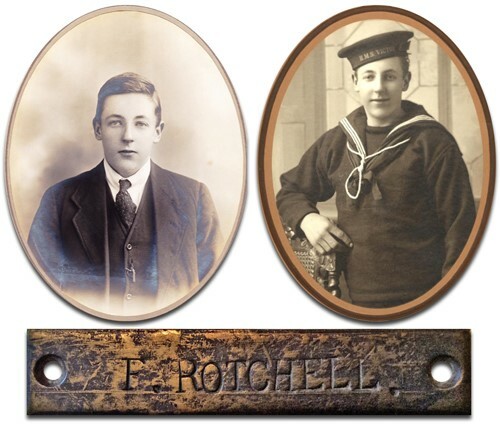 In November 2000, I began to research the naval service history of my wife's Great Uncle - Frederick James Rotchell. I soon found Fred's commemorative entry at the Commonwealth War Graves Commission web site and then a general search of the Internet turned up a few 'hits' about HMS "Opal" (his ship) & HMS "Narborough" being lost in a collision off South Ronaldsay, but unfortunately with very little detail. Up to then, the family thought that Fred's ship had been torpedoed, so the collision theory really grabbed my attention. I posted a request for help on an Internet bulletin board (Naval Help Requests, which has since been ceased), and learned from a contact there Bernhard Sage of a book written by 'Bartimeus' which contained a chapter based loosely on the disaster. Just as Bernhard was beginning to translate the story for me, I had an email from another Internet contact Dave Hepper, who spoke of an entry in the Mariner's Mirror vol 85, 1999. I managed to order a back copy from the Society for Nautical Research and discovered K.D. McBride's article, which was a précis of the Admiralty Records held at the Public Record Office in London. The article stated that all hands bar one (William Sissons) were lost in the accident, during a terrible snow storm. I was now really fascinated by the events and determined to try and discover as much information as possible. My brother and his son promised to visit the P.R.O. for me and see if they could get their hands on the original Admiralty documents - which they did in due course and the result of their hard work is reproduced later in these pages. In the meantime I scoured the Internet and pored over maps to try and pinpoint the actual wreck site, but with little success. It was now March 2001 and in desperation I faxed the Northern Constabulary Orkney Command Area in Kirkwall, asking for assistance in tracking down the owner of the wreck. As it turned out, this was to lead to an amazing discovery! A couple of days after sending the fax I had a call from Chief Inspector Mike Cowdry, who said that I should contact Willy Budge or George Esson on South Ronaldsay and that they could provide me with some very interesting information. He warned me that Willy Budge was very shocked to hear the name Frederick Rotchell, but couldn’t tell me any more. I telephoned George Esson, who was writing a book about the wrecks of Scapa and he wanted to include a chapter about HMS Opal & Narborough. George kindly sent me all his information about the disaster, including a photograph of William Sissons the sole survivor. No wonder Willy’s hair stood up on the back of his neck when he heard the name of the person I was researching. He also relates that there was a torpedo explosion a few weeks after the disaster that blew the main gun from HMS Opal into the hillside above the cliffs. The gun is now in Lyness Museum after being rescued and restored by Willy (it was being used by a neighbour as a drain!) along with a lifebelt that was donated by George Esson. In April 2001, Willy kindly sent me video footage of the wreck site, including a package that contained the brass name plate from the cormorant’s nest which had been re-discovered by Mrs Hazel Scott, who had cared for J.G. Halcro before he died. So there you have it - thanks to the powers of the Internet, the efforts of my brother and nephew, the boundless enthusiasm and kindness of the people of the Orkney Islands (and the very good taste of a house-proud cormorant); my wife and family now have a very vivid and lasting memorial to Great Uncle Fred.